So with the recent weather, I'm sure we can agree that BBQ season is upon us (or if you're hubby, it was always here. That man grilled steaks out on the patio in a -30 windchill) And maybe your BBQ needs a little cleaning up. Why not give it a little facelift of the Lego variety? 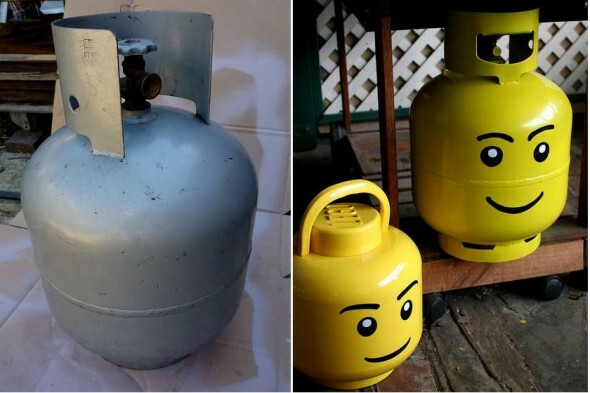 According to the Instructables post, all you need is a bit of paint and you've got yourself a Lego minifig head propane tank. So, the question is... now that you know it can be done, would you? Disclaimer: Hubby cautioned me that this might prevent someone from getting their tank refilled. I checked around and it seems that cities all have different rules about refilling painted propane tanks. Check with your city before you paint your tank, or just paint an old tank and have it as a decoration.